Simon Brook is a celebrated and flamboyant conductor. When he kills himself, his wife Alex is shocked she didn’t see it coming. Guilt-ridden and grieving, she escapes to Hillen Hall, an old house by the sea, abandoning her classical singing career and distancing herself from everyone but her sister Erica. Hillen Hall is an old Brook family home. Once a fine manor house, it is now creaking and unloved. When Theo Hellyon, Simon's cousin, turns up offering to help with its renovation, Alex is confused. She didn’t know Simon had a cousin. And Theo is charming and reminds her of Simon so, despite Erica's warnings, Alex cannot resist having him in her life. But the old Hall has a tortured history which Alex cannot begin to suspect and Theo is not what he seems. How long will it be before she realises she’s making a fatal mistake? Click on the book cover to read the Prologue and first chapter. 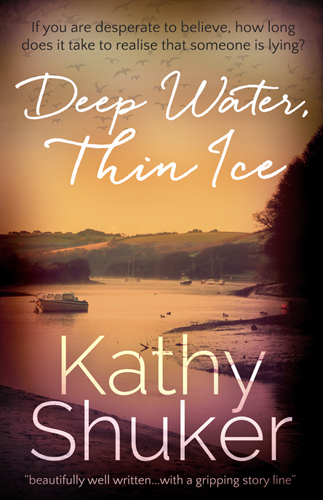 To see Kathy reading an extract from Deep Water, Thin Ice, click here. If you want to purchase the book, you can start reading within a few minutes by clicking the link below. A dedicated e-reader is not necessary: with a free Kindle or Kobo app you can read the novel on a PC, Mac, iPhone, iPad, or on a range of Android devices. Deep Water, Thin Ice is also available as a paperback from Amazon, and by order from Waterstones and most bookshops. It is also in stock at The Harbour Bookshop in Kingsbridge, The Community Bookshop in Dartmouth and Book Stop in Tavistock. My books are sometimes chosen to be read by book clubs and I’m thrilled to know that people are engaging with my stories and characters. It’s also interesting for me to hear your impressions and to see my characters through your eyes. If you have decided to read Deep Water, Thin Ice and would like more information about it, do get in touch. If your club is local to me, I should be happy to come and discuss it with you at a meeting if you would like; alternatively, we may be able to hook up on Skype. I have prepared a list of questions you may choose to consider after reading Deep Water, Thin Ice. Click here to download a copy for your club. Be aware that the questions may contain spoilers!